Yey! My first post for this blog. It's been such a long time when I last wrote anything on a blog so I've decided to share some thoughts on one of my all time favorite food groups -- Pasta! 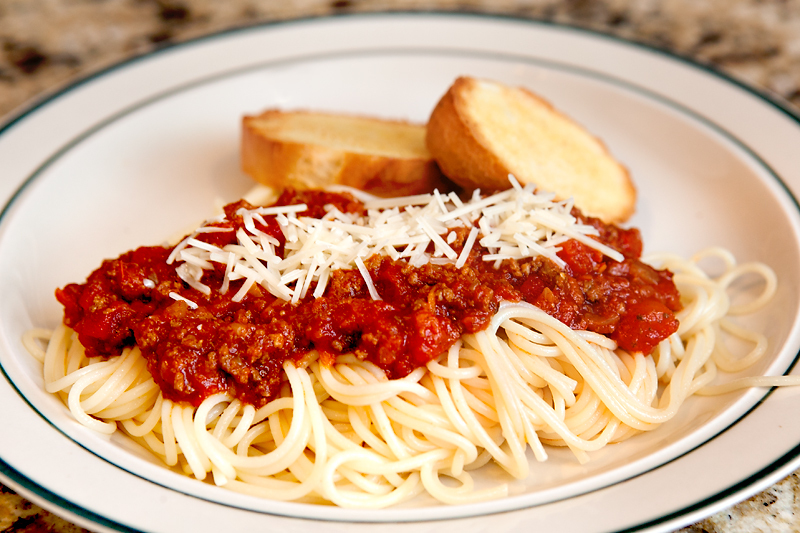 Photo from one of my favorite blogs with this spaghetti meat sauce recipe. Work was pretty much stressful last Wednesday, not to mention that I spent half of my morning going back and forth from home to my uncle's condo. Then in the afternoon, I had to attend a not so stimulating meeting. So by the time I got home, I was pretty tired and I had a really huge craving for pasta and there was no way I could go out for dinner in one of the fancy restaurants that serve pasta because salary day is still tomorrow. But I got home and got quite a surprise. As soon as I opened the door, I asked what's for dinner. Instead of getting the usual answer, I clearly heard my grandmother say she was cooking spaghetti! I was suddenly excited to see if there was cheese in the fridge and enough tomato sauce and whether I still had some basil in the kitchen. Guess my pasta craving is to be satisfied after all.